➊ Press the Power button. key depending on your operating system). ➊ Open the Wi-Fi menu on the device you would like to connect and view the list of available networks. ➋ Select your MiFi 2 Wi-Fi Network Name (SSID) (e.g., Freedompop-XXXX). ➌ Select Connect and enter the Wi-Fi password displayed under Connection Info on the MiFi 2. ➍ After you connect your computer to your MiFi 2 using Wi-Fi, you can access the MiFi 2 Web Interface to customize settings, change your password, access applications and more. Browse to (http://my.mifi), and log in using the default password: admin. ➎ Configure security for your MiFi 2. ➋ Enter the Admin Login password and then click Login. 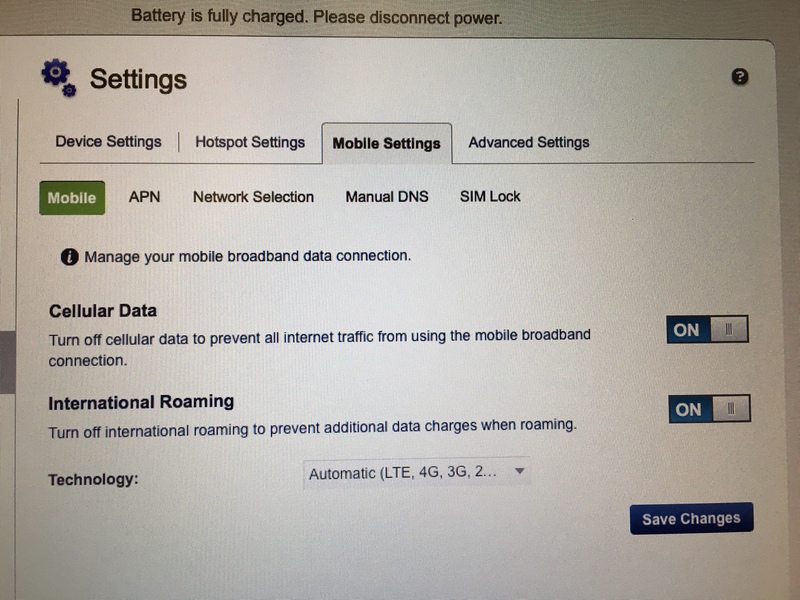 ➌ Click Settings on the Navigation panel and then select Hotspot Settings. The Hotspot Settings > General window opens. ➍ Enter your new Wi-Fi password in the Wi-Fi Password (Key) field. The password must be 8-63 ASCII characters. Note: If you notice you have no Wifi and the Mifi 2 is plugged in. Please unplug the Mifi and test. Members are reporting that the Mifi will not charge and Connect Via WiFi at the same time. reached the alert level specified on this page. ➊ To display your estimated data usage, reset your data counter, and manage your settings, select the Data Usage tab on the Navigation panel on the MiFi 2 Web Interface Home page. ➋ Click Reset Data Counter to restart the data counter, and to set the last reset date to today’s date. ➌ To set your data usage alert level, select the desired option from the Usage alert level drop-down menu. If the desired option is not available, select None, and data usage will be recorded and displayed, but no alerts will be generated. ➍ To set the day of the month you wish the data counter to reset to zero, select the desired day from the cycle start date drop-down menu. ➊ To display your data plan summary, data used, and days remaining in your billing cycle, tap the Data Usage icon on the touchscreen. ➋ To update the data plan summary, click Refresh. Note: Actual billed usage can be higher than estimated data usage displayed on the usage meter. I normally reset mine each time my account rolls over to the new month. Thanks very useful, though one thing I can't convince mine to do is see the current date and time. Any thoughts? When I connect to my wifi hotspot, I get "no internet" error. I can see my laptop is connected for sure, it just can't get on the internet. The MiFi device shows 5 full bars connected to T-Mobile. My account has 1.5 GB data left so data isn't the issue.. I remember it had internet connection once very briefly and since then it has never worked. Anyone got any ideas? Is it important to update the firmware or best to leave it alone? Mine is Software Version 1.1 (L1.44.71 M1.44.6). I just received my Novatel Mifi 2 last week and I'm unable to open the battery cover to get to the SIM. I'm beginning to think it's been intentionally glued together by FreedomPop. Also it looks refurbished, it did not come in its original box and I see scratch marks under the battery cover indicating the previous owner must've used something sharp like a screwdriver to try and pry it open. Unlike other posts on this forum, mine shipped with the battery and SIM pre-installed. Unless someone can tell me how to replace the SIM on this device without resorting to sharp tools like the previous owner, I'm going to have to return this device for a replacement or refund. Received my new unit Friday. I've followed all directions and can connect devices. MacBook Pro, Kindle Fire. They speak to the MiFi unit. Problem is, MiFi doesn't have service. Not anywhere. Not in NC, not in Virginia. Nada. Screen looks nice, but that's it. Anyone know how to get FreedomPop to address this issue? Thus far I've tried contacting them through their Contact form, email, Facebook message from their Facebook page, and telephone. (FreedomPop comes to work at noon East Coast time on Mondays. Wish I could sleep in like that.) No response from anyone at FreedomPop, yet. Short of actually getting the unit to work, does anyone know the return process? I'm having a similar issue. My Hotspot won't connect to LTE, just HSPAN+, although 4G LTE is widely available in my area and surrounding areas. Unfortunately, there is no option for updating the PRL, and regular firmware updates seem to state that the update server is currently unavailable. I reached out to their support by phone, and followed up by email, but I don't believe they know why this is going on either. I suspect it's the SIM card, but am unsure. Hopefully, someone in their support can answer this, since no answer will yield complaints. I have the same problem. No WWAN menu to access PRL option/resets and the firmware update server is not available. I can only see HSPAN, but my freedompop phone gets LTE and 3G just fine. Freedompop phone CS was useless because they just kept directing me to the settings page for WWAN (which doesn't exist). Arrgh, hopefully someone can help soon. I have the same problem as you, CS on the phone was of no help since they just referred me to the setting tab for WWAN, which near as I can tell does not exist. With GSM Data, There is no LTE. Freedompop has the GSM Devices advertised as Edge, HSPA and HSPA+.